Was it the first bursts of fire in another civil war in America? The “run of the mill liberal” who intended to kill off the entire Republican caucus on the baseball field was just a regular guy, according to those that knew him well. They couldn’t believe that he’d plan and carry out a plan to gun down unsuspecting Congressmen on a baseball field, but that’s exactly what he did. Several who were eyewitnesses to the shooting have expressed their belief that Divine intervention must have been the reason that only one was critically injured, given that the attacker was using a rifle, and yet was unable to hit numerous Congressmen even at very short range. Thank God the would-be killer was either a terrible shot, or angels were on hand to see to it that those dozens of bullets missed their mark. Evidence shows that he was an avid consumer of the angry, ever suspicious, ever accusing mainstream and cable news anchors and analysts. The smirking lesbian on MSNBC was his favorite source of “information.” She, the tag team on CNN, and the viscerally smug reporters and commentators from every mainstream outlet have created false and unrealistic expectations in the minds of liberals. They’ve been led to believe that the Trump presidency would be brought down at any moment, at the next hearing or as a result of the next headline in the NYT or the Washington Post. Time and time again their hopes and expectations have been dashed after months of breathless reporting of “possible collusion between the Trump campaign and Russian intelligence services.” Misinformed zealots have been driven nearly crazy with the 24 hour a day drumbeat that President Trump will be convicted of high crimes during the testimony at the very next hearing. Or, the one after that, they’ll nail him for sure! And then… nothing. No smoking gun, no evidence of “collusion,” no evidence of obstruction of justice beyond the tender emotional suppositions of the 6′ 8” Boy Scout who sacrificed his reputation last year to exonerate Hillary Clinton in the long list of demonstrable crimes she’d committed while serving the Obama administration. Since the Director was unceremoniously relieved of his duties as head of the F. B. I., he’s been emotionally conflicted about private conversations he had with the president months earlier. Contrary to his testimony, under oath before Congress where he swore there had been no effort to impede any inquiry, suddenly, in the wake of his dismissal, he’s not so sure.. If someone is eventually successful in bringing down President Trump, can you imagine the praise and worship they’ll receive from the purveyors of hatred toward this administration? Whether or not you’ve noticed, the middle aged attempted murderer of all the players on the the baseball field is being vindicated by an explosion of hatred on social media. “He had it coming… that KKK whore!” That’s the tune they’re playing, and there are reams of it. There is no doubt whatsoever that the mainstream left despises the conservative positions of the man who now lies in critical condition, subjected to a series of delicate operations to try to save his life. Steve Scalise has been in full throated support of the current agenda, which in fact existed in the hearts of many patriotic Americans long before the emergence of the current president as a politician. Scalise is in favor of the deportation of illegal alien criminals, in favor of the 2nd Amendment, wants the influx of refugees limited, wants the southern border defended, Planned Parenthood defunded, and so on down the list of socialist sacred cows. If Mr. Scalise doesn’t make it, the left will celebrate openly. A Trump look-alike is being stabbed to death nightly in a Central Park, off-Broadway production to a standing, cheering audience. The list of shootings, beheadings and angry threats (Madonna said, “I’ve been thinking an awful lot about blowing up the White House.”) issued by celebrities is long and growing. They’ve couched their language and imagery in terms of life and death. In essence, Trump and his supporters deserve death and destruction so their Utopian dream won’t be interrupted. Friendships are being jettisoned, marriages broken up and families ripped apart, so emotionally charged are the “feelings” over the possibility that the United States might be returned to some of the fundamentals of its creation. This organization has not attempted to get involved in elections or politics whatsoever. First of all, any such attempt wouldn’t amount to a belch in a whirlwind. But the real reason is, it’s not a part of our commission. Ours is to continue to put out the unexpurgated message of the gospel, repentance and the path to salvation, while at the same time keeping watch of the world events that are propelling all of us toward the times of trouble of which the Bible warns. The threats to western civilization, the influence of the papacy, the downward spiral of morality, the influx of culturally incompatible populations into the Israelitish nations, of terrorism against innocent civilians and of leaders who refuse to acknowledge the dangers that politically-correct dogma presents to a formerly lawful society, those are things with which the Church of God has always concerned itself. Some will find it painful to see their sacred cows slaughtered, and for that we’re sorry. But we will not shy away or be intimidated by the doctrines of political correctness, many of which are inventions of communist ideology. The Bible says man’s righteousness is like filthy rags to God, and its hard to imagine any “righteousness” filthier than the doctrines that have infected media, institutions of “higher” learning, or yes, even the churches of mainstream Christianity. The Bible is replete with prophecies, End Time prophecies concerning the modern descendants of the ancient tribes of Israel. The Jews, Judah, are but one of the Tribes. Who are the others? Can the TEN Tribes that made up the House of Israel, following the death of Solomon, in opposition to the House Of Judah, be identified in this modern world. They certainly can. There is a plethora of meticulously researched material from various authors, including Yair Davidy, a Jewish researcher and author living in Israel and Steven Collins, whose books can be found on Amazon.com among others. BUT, you can have an equally well researched book, authored by Garner Ted Armstrong, that traces the Biblical promises to Abraham, Isaac and Jacob and traces the history of the Tribes of Israel right up to the present time. Who are they? Where are they today? What does Bible prophecy foretell for these modern Israelitish nations as we approach the end of the age and the return of Jesus Christ. The time when Jesus Christ plainly stated, “22And except those days should beshortened, there should no flesh be saved (alive): but for the elect’s sakethose days shall be shortened.” Matt. 24:22 (read all of Matthew 24! 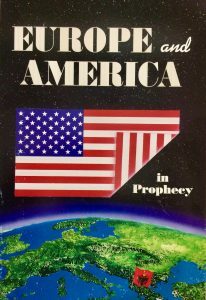 Call or email for a FREE copy of “Europe and America in Prophecy”. In the USA call (903) 561 7070, in Australia call 1300 885 066 or email from anywhere gta.info@ozemail.com.au or use our website CONTACT page .